Let me share my project first, but following that are the Giveaway details! would fit perfectly. For more dimension, I did use some enamel dots for the eyes. I look forward to trying out more of the faces in upcoming projects! EACH DAY Miss Kate Cuttables is giving away a file to EVERYONE who comments and Follows the Design Teams' hop post. Be sure to comment on THIS post and FOLLOW my blog!! I'm your last stop for today! I hope that you've enjoy the hop and all of the fun Spring finds! This card is adorable. Makes me want to pinch his cheeks. I'm a new follower. I love your project. I love the eyes and cheeks. I am a new follower. Awwww, those little cheeks just make you want to reach out and squeeze them. Love it. What a sweet, sweet card! I love the textured, soft colors, the twine, the teddy face.... all of it! Beautiful! This is so cute and sweet! The card design is fantastic and your little bear is adorable! Too sweet! Love his pink cheeks! Love the colors and the card layering. The bunny in the egg is just too cute. What a sweet card. This is really cute! Could use this for a baby shower as well!! The cheeks on this little bear is so cute. Wow, great job I love the little detail like he bunny ears...as well as the face stamp you used. Thank you for sharing. Adorable card! I like how you used the enamel dots with the stamp. I love those sweet cheeks! Your bunny bear card s so adorable!! Adorable! The cheeks on this little bear are just too cute! What a great kids Easter card. You've inspired me to get my bear out and make some baby cards. Thanks!!!! What an awesome Easter card, Love that bear/bunny!!!! The colors are just Yummy!! Adorable card! Love it!! New Follower..very happy that I found you!! So cute, love the bright colors. Great job, thanks for sharing. I love you card. I like how the different face stamps change the look of the cutouts. Very cute card, love those cheeks. Love the cheeks on the bear, cute card. This is the sweetest little card. The soft colors you used made it just so adorable. This little bear is so cute. Love this card. Thanks. 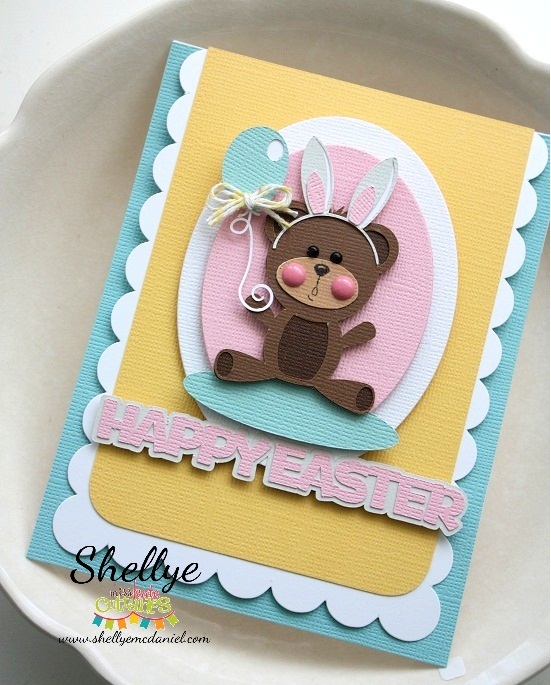 Your Easter bear card is so adorable. I love those ears and cheeks. Oh this is so cute! Love the cheeks! Hi Shellye I am a new follower and I love your blog I did a little poking around and looked at some other projects of your, TOTALLY AWESOME GIRL!!! I love your project for this co hop. Such a sweet card ... love it! Sweet job on your little bear cut. I like the enamel eyes and cheeks. 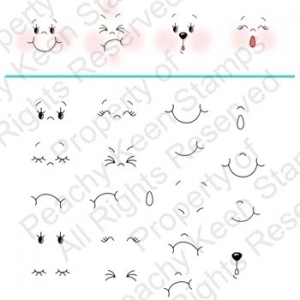 The Peachy face is so cute...I like how much expression the faces give what ever project they are on. Super job on your card. I forgot to mention that I also follow your blog. This is super cute!!! Love his cheeks!! Very sweet card, I love the soft colors and the darling bear! Omg, your card is super adorable, I am a new follower, tfs! Awww...your card is just precious!! You gotta love those little cheeks... so cute!! Cute card, love how you used enamel dots for the cheeks. OH my goodness, this is just adorable!!! Those have got to be the sweetest cheeks I've ever seen hehe!!! Love it and thank you for sharing your wonderful card for todays hop! This has been a most fabulous week of hopping with 2 amazing companies!!! Hugs and blessings for a happy Easter weekend! Love your card. Love how you did the eyes and cheeks. Seriously adorable! I am a new follower and look forward to visiting your blog again! Great job on your card!! Super cute, love how you made the bears cheeks. Lovecthecrabbit ears on the bear...how cute! bear bunny is so cute!!! What a adorable Easter card!! Love the detail you added on the bear's face. Thank you for sharing. What an absolutely adorable Easter card. I love the face. Such a cute little card. Thanks for sharing. Such a cute bear/bunny card! Great job!